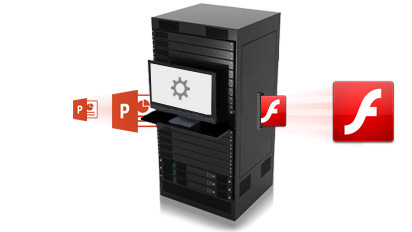 PowerFlashPoint PowerPoint to Flash SDK (Software Developing Kit) is a sophisticated SDK Component, allowing you to easily integrate and leverage this leading PowerPoint to Flash conversion tool in an easy fast and economical way by developers for Desktop applications, Web applications or Web services. Converted Flash output works ditto PowerPoint preserving all effects. Convert 2X faster than other converters (Windows 8 supported here). Converted Flash output is SCORM compliant.